For each tag assigned, you can choose whether it applies to the tagged files’ families as well, or just to the files. In addition to this, you can even set the default behavior for each tag - so you could make the ‘confidential’ tag always get applied files’ families, but a ‘conversation’ tag apply only to the file that is being explicitly tagged. Assigning a tag will prompt you to choose how the tags should be applied if they do not already have their behavior set already. When the screen below appears, choose from one of the two available options. the next time the ‘Goldfynch’ tag is assigned to files, it will raise this same prompt again, asking whether it should be applied to just the selected files or the files and their families as well; the others two will not raise prompts. 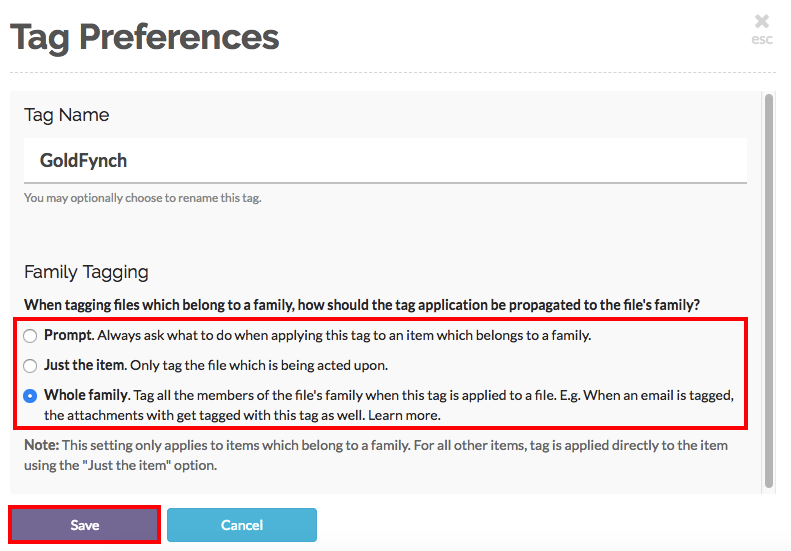 The ‘Important’ tag will automatically apply just to the selected files, and the ‘Confidential’ tag will automatically apply to both the selected files and their families.